Proclear Multifocal XR are produced by CooperVision and are intended to correct high levels of presbyopia. 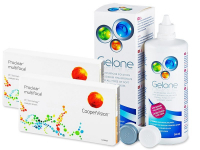 This value package contains two boxes of three lenses each and a 360 ml bottle of Gelone solution with an antibacterial lens case. Proclear Multifocal are produced by CooperVision and are intended to correct higher levels of presbyopia. Those users whose presbyopia reaches a high value addition (up to +4.00 ADD Power) will experience, clear, sharp vision at all distances thanks to Proclear's patented Balanced Progressive ™ technology.